It was Feb. 1. The Golden Knights had just dropped a 5-2 decision to the Carolina Hurricanes. And as the Knights trudged off the ice at the PNC Center in Raleigh, it was turn-the-page time and focus on the next game against the Florida Panthers the following night. The Hurricanes, however, weren’t quite done. They call it the “Storm Surge” in Carolina. Don Cherry calls it something else. Cherry, who is 85 and has had a bully pulpit for decades on the CBC’s Hockey Night in Canada telecast, ripped the ‘Canes. These guys to me are jerks. 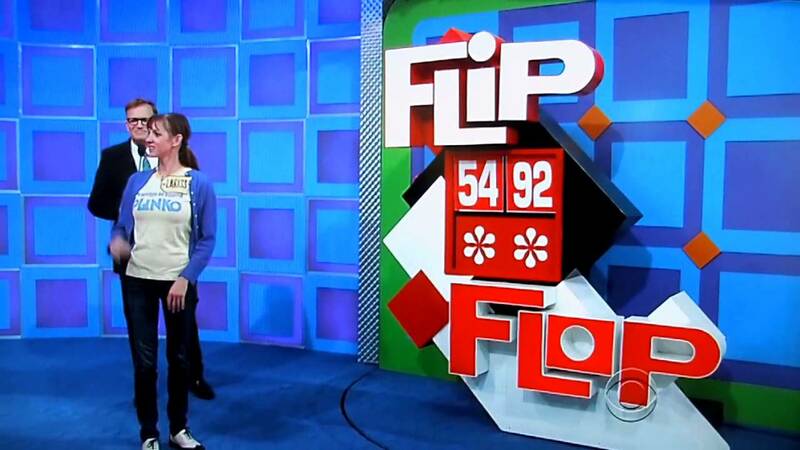 And I’ll tell you one thing, they better not do this in the playoffs.. . . This is a joke. Young men expressing themselves for joy of winning. You don’t do this thing in professional hockey. What are these guys? Jerks or something? The team obviously has a different point of view. Williams, the team’s captain, plays a major role in all this. And the coach doesn’t have a problem with the postgame celebrations. My first thought when I saw the initial celebration earlier this year was, “What the hell is that?” But as the cellys became more creative and elaborate, I started to enjoy them. I hadn’t played Duck, Duck, Goose since I was a tyke back in the late 1950s. So I have to admit seeing a bunch of grown men doing it was pretty funny. And the others are funny too. The fans offer suggestions, the players take them under advisement and then figure out what they’ll ultimately do. Understand these “Storm Surges” take place after victories at home, long after the opposing team has left the ice. So the night of Feb. 1, all of the Golden Knights were in their locker room when the frivolity began, so none of them saw it. An early penalty put the Golden Knights on the power play which they cashed in on with a Shea Theodore goal eerily similar to the one he scored against Pittsburgh. Carolina came right back creating chances left and right before getting one to go on a great kick pass from Justin Williams to Nino Niederreiter. A miserable error by Max Lagace to start the period led to the Hurricanes first lead. Vegas battled through a poorly played period to tie it at two but less than a minute later Carolina retook the lead again. The Golden Knights couldn’t get anything going in the 3rd as they conceded an early goal to go down a pair. An empty netter late sealed it. The Creator speaks about the possibility of losing AGM Kelly McCrimmon. A mistake in his own end by Nick Holden led the Leafs to score their first goal in the first two periods of a home game in quite some time. The Golden Knights fell asleep in the first :09 of the 2nd, conceding again. Then, things turned around in a big way. Vegas completely dominated the remainder of the period but only got one goal from Cody Eakin in it. Through two periods the Golden Knights attempted 61 shots, only 30 made it to the goal and only one went in. The Golden Knights continued the pressure but couldn’t get the tying goal. Erik Haula was injured and taking off on a stretcher in the 3rd period. Yet another similar story to so many games this year. Missed shot, missed shot, missed shot, missed shot, missed shot. Someone hit the damn net with a shot! A frantic 1st period with over 20 scoring chances total from both teams combined. Brad Hunt jumped up into a play and put a perfect pass from Erik Haula into the back of the net. Ryan Reaves tallied another goal, his fourth of the season, in the 2nd. Vegas scored the game’s third goal as well with William Carrier’s first in over a year. Marc-Andre Fleury was tremendous all night earning him the shutout. Great game through and through for VGK when they really needed it. We know this term gets thrown around WAY too much, especially when it comes to Game 14 of an 82 game season, but if the emotional leader calls tonight’s game against the Hurricanes a must-win, it must be a must-win. Okay, fine, he didn’t say must-win, but “definitely need to win” is close enough for me. It’s kind of unimaginable, that on November 3rd we’re talking about important games for the Golden Knights, but this is reality when a team is already four points out of a playoff spot and have their bags packed for a four-game road trip to the other side of the continent. It’s not just the two points that the Golden Knights want, it’s more that this team is a franchise that’s experienced nothing but winning, and they are sick of losing. He said “must-win!” Well, really, he said it is, then said it isn’t, then said it is again. So… I think I like what Marchy said better. In Florida, Marchessault and Gallant faced a slow start which ultimately costed Gallant his job. While we’re nowhere near that situation here, the bigger point is that Panther team was never able to regain a playoff spot. Tonight is the perfect spot for #81 and his teammates to turn things around. Carolina comes in with an acceptable 6-5-2 record, but have lost three straight including an overtime tilt in Arizona last night. Carolina fell into a 3-0 hole in the 1st, only to climb back to tie it, and then lose in OT. We’ve been told there’s a locker room full of leaders. So I’m sure it’s eating at each and every one of them to come home from their road trip empty-handed. Tonight is a game that could help the Golden Knights set themselves straight. And I’m sure that’s the message Marchessault is spreading around the room. The Golden Knights got off to a slow start including a gaffe behind the goal by Brayden McNabb leading to the Hurricanes first goal. 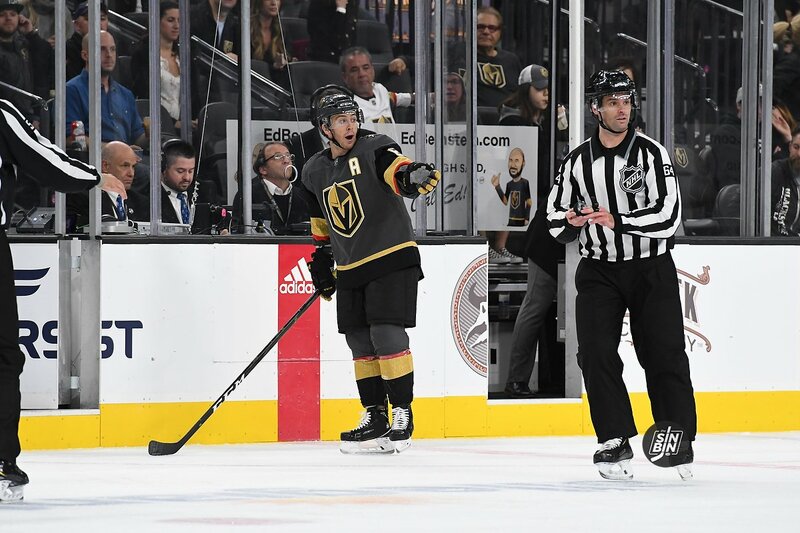 Vegas picked the tempo back up in the 2nd and were able to tie the game at one and then again at two with goals from Deryk Engelland and Reilly Smith. Things got a bit chippy in the 3rd but no one could break through. It went to shootout where Vegas got the first one on shot number three from Smith, but Fleury couldn’t keep the Hurricanes out. 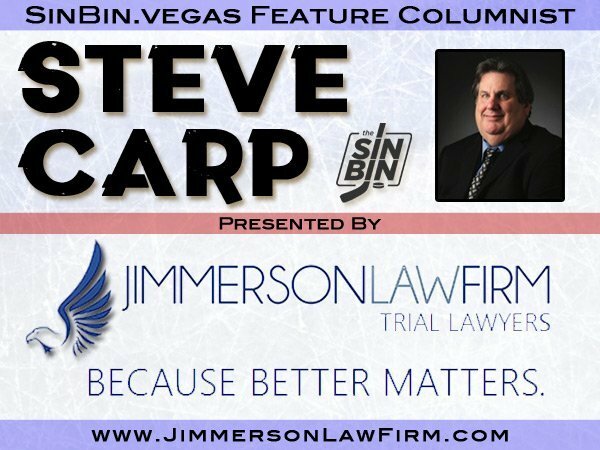 Upcoming stories from the Vegas Golden Knights vs. Carolina Hurricanes at T-Mobile Arena. Did the Hurricanes aggressive early shot selection play into Fleury’s easy transition back into action? The rumors are swirling in Carolina that Peter Karmonos Jr. is close to selling the team to former Texas Rangers owner Chuck Greenberg. The asking price should sound very familiar for Golden Knights fans. Of course while writing this article Forbes put out a story calling the Bloomberg report fake news, but who are we to get in the way of the McGregor/Mayweather battle of business website reports. The first thing to realize when comparing which franchise is the better buy is the fact that $500M does not equal $500M when it comes to these two organizations. There’s a massive operating cost to get an expansion team to the same organizational framework as a team that’s been in Raleigh since 1997 and been in the NHL since 1972. Vegas needed a staff, an office, a practice facility, retirement plans, health care options, and a ton of “start-up business” marketing. It’s just an estimate based on what we know about the organization, but we believe The Creator is over $1 billion into the Golden Knights franchise, and their first game is still 84 days away. Back to the Hurricanes. In cutting a check to the Karmanos family for $500M, what are you actually getting? First, a fully operational organization from team president to street teamers. Next is a hockey history. Now I’m not about to go out and say it’s a rich one, but the Hurricanes do have more Stanley Cups than the Capitals, Sharks, Senators, Predators, Panthers, Sabres, Canucks, Blues, and… the Golden Knights. Last is a roster of players and a pretty solid one at that. But, the Hurricanes are ranked last in value on the Forbes “Business of Hockey List.” According to Forbes, they operate at a $15M a year deficit. They have the worst attendance in the NHL, filling just 64% of the building a night, and the team hasn’t been in the playoffs since 2009. There’s an old saying, “there’s more than one way to skin a cat.” There’s another saying, “a bird in the hand is worth two in the bush.” There’s even another one that goes, “you can only see the tip of the iceberg.” Then there’s a trade in which the Vegas Golden Knights acquired Marcus Kruger for “future considerations” on Sunday and a 2018 5th round pick for Marcus Kruger on Tuesday. All of that belongs in one paragraph, believe me. Prior to the Expansion Draft the Chicago Blackhawks were one of the many teams that appeared to be in a bit of a pickle. They were hampered with seven NMCs and a salary cap situation that needed to be resolved. So, George McPhee and Stan Bowman got to work. An agreement was made, Vegas would select Trevor van Riemsdyk at the Expansion Draft, trade for Marcus Kruger afterwards, and the Blackhawks would take “The Pledge” to not make a move get in the way of any of it. It took some time to complete the process, because of a $2M bonus in Kruger’s contract that was to be paid by Chicago, but on Sunday night the deals were done and Vegas and Chicago’s interaction with expansion was over. There are so many ways to look at what went down here, and all fans/armchair GMs are free to look at it which ever way they please because you as you know, there’s more than one way to skin a cat. The wheels inside the head of one of the best reporters in hockey, Gary Lawless, were spinning after the first week of May came and went without any significant expansion news. One other rumour making the rounds on Friday has expansion being announced this spring but pushed back by a year until the 2018-19 season. There’s the possibility the league will wait until the beginning of June. Bettman may want to squeeze the announcement into the days between the conference finals and the Stanley Cup to not take any attention away from the games on the ice. Let’s start with the 2018-19 idea. According to sources in direct contact with the organization here in Las Vegas, 2018-19 has never been suggested to The Creator at any point. Next, the Carolina stuff. No matter who you talk to, or what is written in the media, relocation rumors are nearly impossible to decipher. Could it happen? Maybe. Is it likely? No. We’ve got plenty of details directly pertaining to the expansion announcement. From our lunch with The Creator to the new expected date we’ll hear the good news to the Quebecor/Carolina saga. This one is chock full of real news. Hosted by Ken Boehlke. The Creator offered up some pollen, we’re here to spread it. As much as we can tell you about our super special lunch that we can’t stop talking about. Quebecor turned down an offer of $500 million to purchase the Carolina Hurricanes. Why the NHL cares more about Las Vegas than Quebec City or any other proposed expansion location. Ken and Dana have a hard time conversing through text and Twitter. Is Dana a jealous person?